Depending upon traffic and weather conditions, holding may be required. Holding is a predetermined maneuver that keeps aircraft within a specified airspace while awaiting further clearance from ATC. A standard holding pattern uses right turns, and a nonstandard holding pattern uses left turns. The ATC clearance always specifies left turns when a nonstandard pattern is to be flown. In a standard holding pattern with no winds [Figure 10-4], the aircraft follows the specified course inbound to the holding fix, turns 180° to the right, flies a parallel straight course outbound for 1 minute, turns 180° to the right, and flies the inbound course to the fix. Figure 10-4. Standard holding pattern-no wind. Compensate for the effect of a known wind except when turning. Adjust outbound timing to achieve a 1-minute (11⁄2 minutes above 14,000 feet) inbound leg. 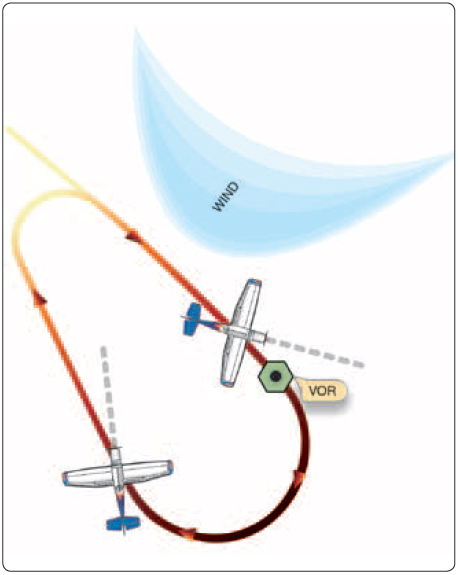 Figure 10-5 illustrates the holding track followed with a left crosswind. The effect of wind is counteracted by applying drift corrections to the inbound and outbound legs and by applying time allowances to the outbound leg. Figure 10-5. Drift correction in holding pattern. Radial, course, bearing, airway, or route on which the aircraft is to hold. Leg length in miles if DME or RNAV is to be used (leg length is specified in minutes on pilot request or if the controller considers it necessary). Direction of turn, if left turns are to be made, because the pilot requests or the controller considers it necessary. Time to expect-further-clearance (EFC) and any pertinent additional delay information. It is determined that a delay will exceed 1 hour. A revised EFC is necessary. In a terminal area having a number of NAVAIDs and approach procedures, a clearance limit may not indicate clearly which approach procedures will be used. On initial contact, or as soon as possible thereafter, approach control advises the pilot of the type of approach to expect. Ceiling and/or visibility is reported as being at or below the highest “circling minimums” established for the airport concerned. ATC transmits a report of current weather conditions and subsequent changes, as necessary. An aircraft is holding while awaiting approach clearance, and the pilot advises ATC that reported weather conditions are below minimums applicable to the operation. In this event, ATC issues suitable instructions to aircraft desiring either to continue holding while awaiting weather improvement or proceed to another airport. The entry procedures given in the AIM evolved from extensive experimentation under a wide range of operational conditions. The standardized procedures should be followed to ensure that an aircraft remains within the boundaries of the prescribed holding airspace. When a speed reduction is required, start the reduction when 3 minutes or less from the holding fix. Cross the holding fix initially at or below the maximum holding airspeed (MHA). The purpose of the speed reduction is to prevent overshooting the holding airspace limits, especially at locations where adjacent holding patterns are close together. Holding patterns from 6,001 to 14,000 feet may be restricted to a maximum airspeed of 210 knots indicated airspeed (KIAS). This nonstandard pattern is depicted by an icon. Holding patterns may be restricted to a maximum airspeed of 175 KIAS. This nonstandard pattern is depicted by an icon. Holding patterns restricted to 175 KIAS are generally found on IAPs applicable to category A and B aircraft only. Holding patterns at Air Force airfields only—310 KIAS maximum, unless otherwise depicted. Holding patterns at Navy airfields only—230 KIAS maximum, unless otherwise depicted. The pilot of an aircraft unable to comply with maximum airspeed restrictions should notify ATC. Figure 10-6. Holding pattern entry procedures. Parallel Procedure. When approaching the holding fix from anywhere in sector (a), fly to the fix. Afterwards, turn to a heading to parallel the holding course outbound. Fly outbound for 1 minute, turn in the direction of the holding pattern through more than 180°, and return to the holding fix or intercept the holding course inbound. Teardrop Procedure. 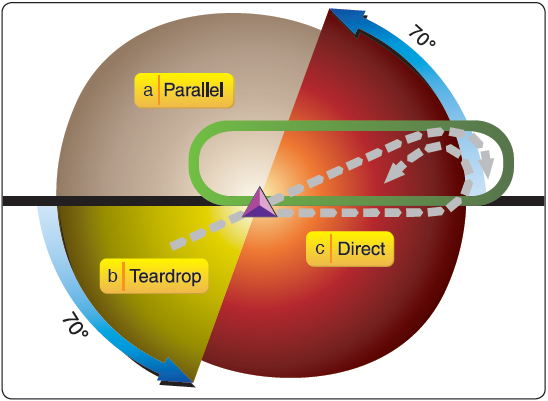 When approaching the holding fix from anywhere in sector (b), the teardrop entry procedure would be to fly to the fix, turn outbound to a heading for a 30° teardrop entry within the pattern (on the holding side) for a period of 1 minute, then turn in the direction of the holding pattern to intercept the inbound holding course. Direct Entry Procedure. 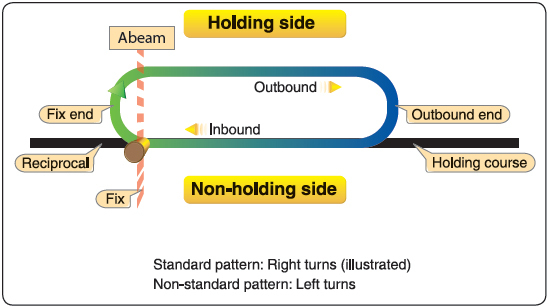 When approaching the holding fix from anywhere in sector (c), the direct entry procedure would be to fly directly to the fix and turn to follow the holding pattern. A bank angle provided by a flight director system. After the IFR flight plan has been cancelled, if the aircraft is holding in VFR conditions. The same entry and holding procedures apply to DME holding, but distances (nautical miles) are used instead of time values. The length of the outbound leg is specified by the controller, and the end of this leg is determined by the DME readout.